Verses 1-7 Israel sets out with all his family and possessions for Egypt. They stop at Beersheba to offer sacrifices. God speaks to Israel in a vision, “I am God, the God of your father, do not be afraid to go to Egypt, for I will make you a great nation there.” God says He will go with Israel and He will bring them out. All the descendants of Jacob come to Egypt. Reuben and four sons; Simeon and six sons; Levi and three sons; Judah and five sons to begin with, but two sons die – so he comes with three sons and two grandsons; Issachar and four sons; Zebulun and three sons – These are Leah’s sons, born to Jacob, plus a daughter, Dinah. Gad and seven sons; Asher and four sons, one daughter, and two grandsons – These are Zilpah’s sons born to Jacob. Joseph (who is in Egypt) and two sons; Benjamin and ten sons – These are the sons of Rachel. Dan and one son; Naphtali and four sons – These are the sons of Bilhah. That’s 66, not counting wives, plus Jacob (Israel) and Joseph and his two sons. Seventy descendants of Israel came to Egypt. Verses 28-34 Jacob sends Judah to Joseph so he can lead the way to Goshen. 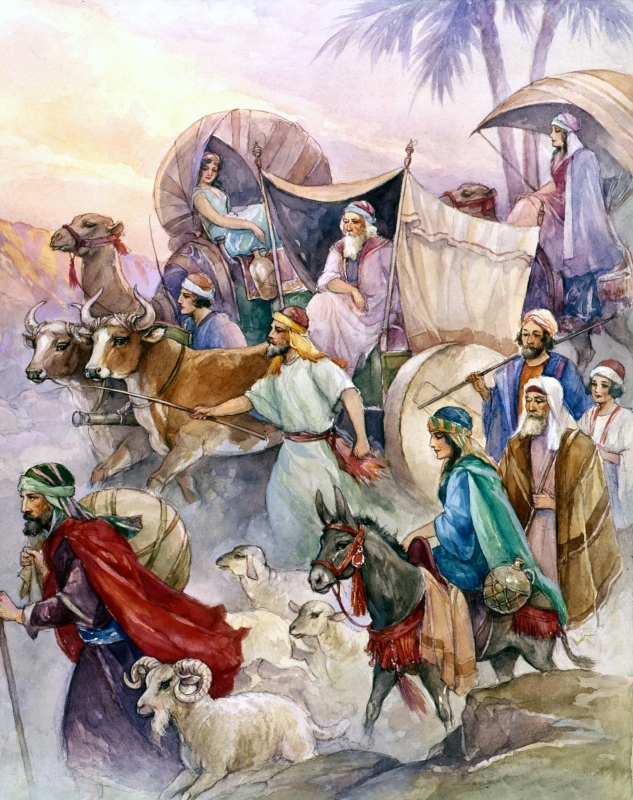 Joseph goes to Goshen to meet his father. He cries when he sees him. Jacob is thankful to have lived to see Joseph alive. Joseph advises Jacob to emphasize the raising of sheep as their livelihood when talking to Pharaoh. This will make Pharaoh leave them all in Goshen because Egyptians despise shepherds. Verses 1-6 Joseph tells Pharaoh all this. Pharaoh gives them free use of the land of Egypt and Goshen – which is the best – for their own. He also entrusts his livestock to their care. Verses 7-12 Jacob meets Pharaoh. He is 130 years old at this time. This is “few” compared to his fathers! Jacob and Pharaoh discuss the arrangements, as they’ve been discussed with Joseph. Joseph settled his family in the land of Ramses, as Pharaoh commanded. Verses 13-26 The famine is still very severe. Joseph reports of all the money raised by selling grain to Canaan and Egypt to Pharaoh. There is no more money for the people to spend, so Joseph agrees to take livestock in exchange for food. The people offer their lands and service in exchange for food when the livestock runs out the next year. This way Joseph bought all of Egypt for Pharaoh. The he moved the people into different places in the country – except for the priests who were provided for by Pharaoh. He told the people they owed one-fifth of the harvest to Pharaoh. This law remains in effect for long time. Verses 27-31 Jacob lived in Egypt 17 years and prospered. When Jacob was ready to die, he asked Joseph not to bury him in Egypt, but to return him to Canaan. Joseph agrees to do this.